The Division of Purchasing and General Services is divided between Purchasing, which provides purchasing and contract oversight for all State Cooperative and agency contracts, and General Services which consists of State Mail and Distribution Services, Print Services and the Surplus Property Program. 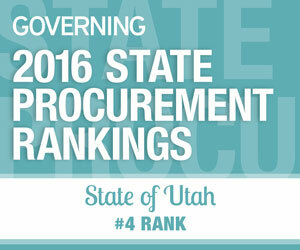 The Utah Division of Purchasing is recognized as one of the best managed public procurement agencies in the nation. Annually, the division managers over $2.0 billion in public spend for goods and services. State Purchasing manages over 800 cooperative contracts for goods and services used by state agencies, local governments and educational entities across the State. Cooperative contracting brings together the buying power of all government entities resulting in lower prices through volume discounts, higher quality goods and services, and stronger contract terms and conditions. General Services consists of State Mail and Distribution Services, Print Services, and Surplus Property. State Mail provides mail preparation and distribution services to state agencies, cities, and special service districts between Ogden and Spanish Fork. Services include intelligent inserting, automated inserting, folding, tabbing, address printing, presorting, and mail design. State Mail’s USPS discounts and automation amount to almost $2 million per year, in addition to increased efficiencies. Print Services consists of Digital Print Services and the State Copy Center. These services are provided to state and local government agencies, government institutions, and political subdivisions. The State’s Surplus Property Program is responsible for the accounting and ethical disposal of State-owned property, first through reutilization, then public sale.